Work AC has conceived a new, porous infrastructure for Shenzhen. Work AC has won a competition to redesign the streetscape, infrastructure, and public image of one of China’s most intriguing thoroughfares: Hua Qiang Bei Road, a retail, fashion, and electronics manufacturing corridor in Shenzhen. Working with Arup, Balmori Associates, and ZhuBO Architecture Studio, the architects have proposed redesigning a one kilometer section of the road by improving the landscaping and completing a below-ground subway link and other infrastructure improvements. Above ground, the project gets more visually exciting, with a series of curved and looped pedestrian crossings that also function as cultural buildings and public amenities. The project covers a kilometer along Hua Qiang Bei Road, a major retail strip. The area evolved over time from predominantly manufacturing to a mix of retail alongside manufacturing. It is lined with midrise and highrise buildings, many of which have floors of workshops or warehouses. The street is extremely congested with foot and auto traffic, as well as vendors, bicycles, trucks, and buses, according to Dan Wood and Amale Andraos, the principals of Work AC. 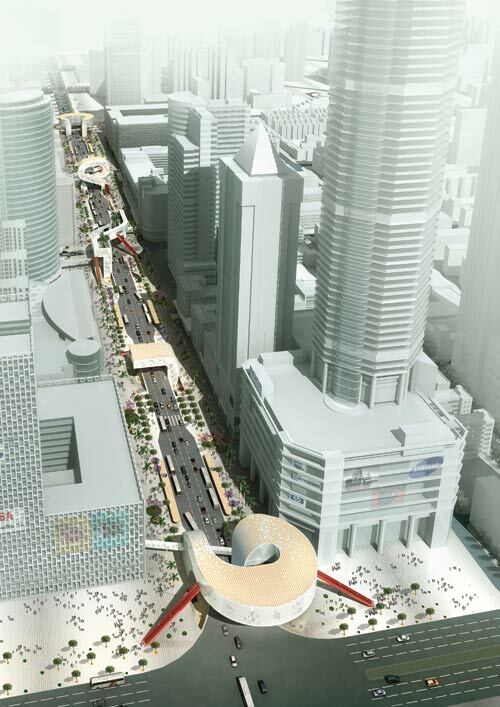 The city of Shenzhen controls about 45 feet of the sidewalk, on which they had proposed building a monolithic elevated pedestrian street, which they called the “3-D Street,” as a means of alleviating ground level congestion. In their own proposal, Work AC presented discrete twisting and looped elements inserted into the street, which they call “lanterns.” “We didn’t want to create a series of walls,” Andraos said. 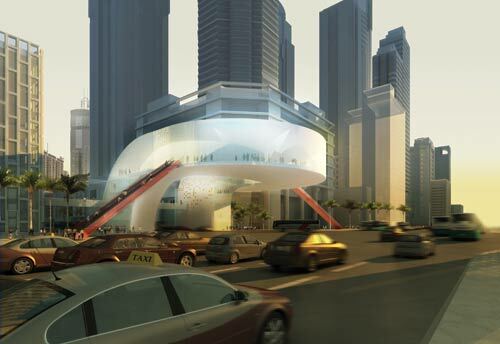 Instead, they proposed a series of elevated crossings with various programs, including a fashion museum, an electronics museum, and an elevated park. “The Chinese pushed for public and cultural space in the lanterns,” Wood said. “The project has become about improving the identity of the street.” Many of these structures will also be linked to pedestrian bridges from individual buildings, providing cut-throughs for deliveries. Below grade, new spaces provide continuous connections between a food court, new library, performance spaces, and four new metro stations. “I think here we have a phobia of streets in the air,” Andraos said. “In Asia, there are lots of precedents where they work.” The architects aim to make sure the crossings are also an efficient means of navigation. “It’s about as long as it takes to wait for a light,” she said.